Aaahhh I love this time of year! All the amazing produce spilling off the stands at farmers markets makes me happier than I can express. Even the regular old grocery store has gorgeous fruits and veggies that make me want to run to the kitchen and bake up a storm. So I waited and waited and waited for what seemed like foreverrrrrr for good zucchini to show up in the store again. And it’s here! And I made this bread and it was soooo worth the interminable wait. 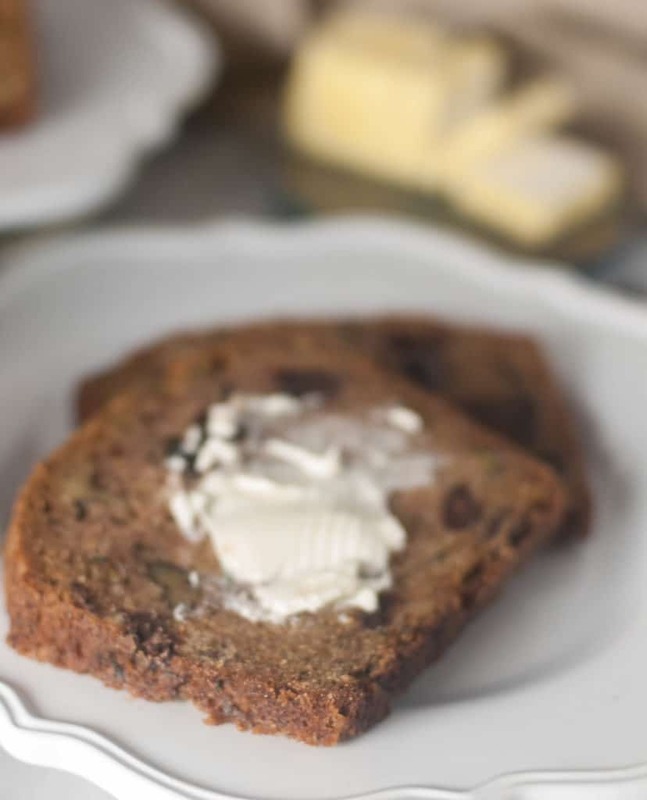 This bread is just packed with fresh zucchini flavor and the crunchy walnuts are perfection in the moist bread. Chocolate chips obviously don’t hurt either. If you’re not a fan of walnuts you can sub in any other nut, or just leave them out. Or add a few more chocolate chips! Don’t want the chocolate in there? Leave it out, add more nuts, maybe swap in some butterscotch chips. Butterscotch would be a fun twist. And I just might have to make some butterscotch zucchini bread soon. Why can’t I just leave a good recipe as-is? Life’s rough some days ☺. 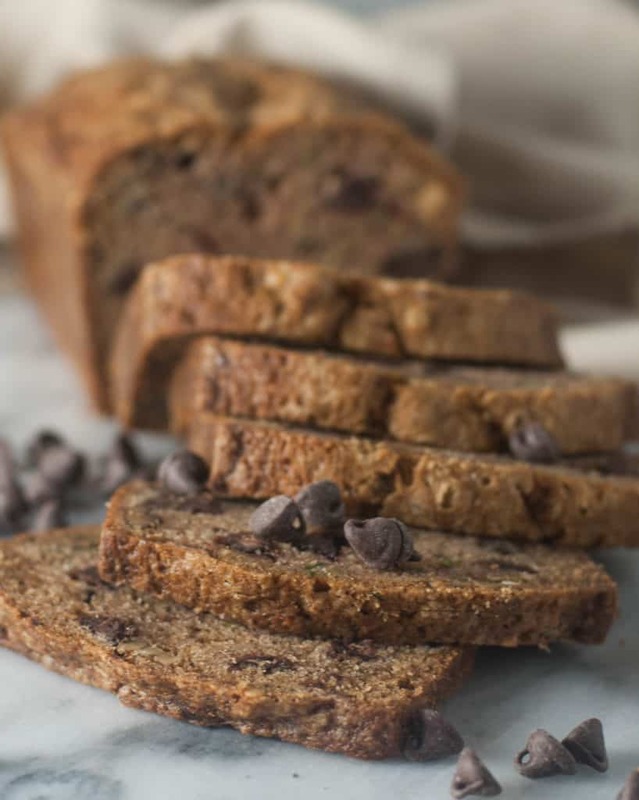 A word of warning: this bread needs to be refrigerated overnight before serving so the flavors develop fully, so be sure to plan that time into any bread-baking plans you might have. What does it say about me that three of the four pictures in this post contain butter? Nothing good, I’m sure. 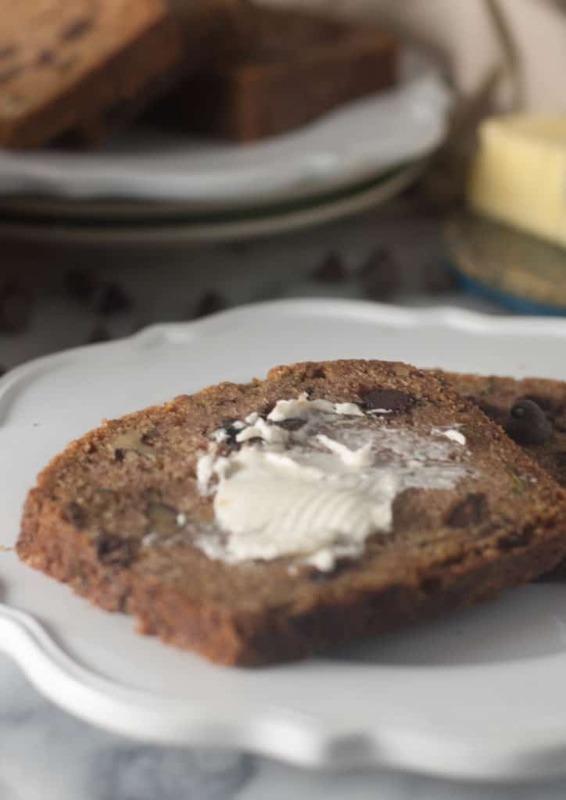 An easy quick bread packed with chocolate chips, walnuts, and lots of fresh zucchini flavor. Preheat the oven to 350 degrees. Grease and flour a 9- by 4-inch loaf pans. 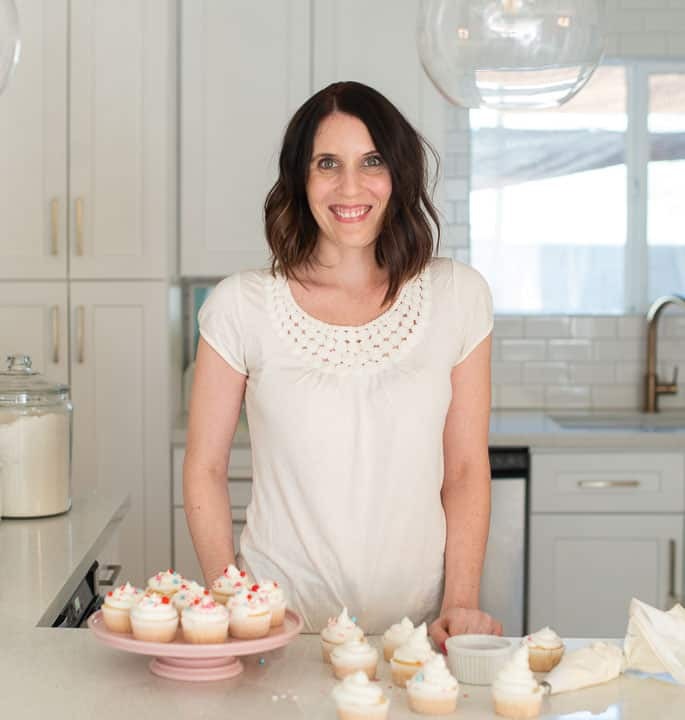 Whisk together the oil and sugar in a medium mixing bowl. Whisk vigorously until creamy and light in color. Add the eggs and vanilla and beat again until well combined. Place grated zucchini on several paper towels and squeeze to remove as much liquid as possible. Stir zucchini into the batter. Pour the batter into the prepared pan and bake in the center of the oven for 65 to 75 minutes, until the top is firm and loaf pulls away from the sides of the pan. A cake tester inserted into the middle of the bread should come out clean. Let the loaf cool in the pan for 30 minutes before removing and cooling completely on a wire rack. Wrap tightly in plastic wrap and refrigerate overnight before serving. My mom used to make this for me when I was a kid!! One of my faves by far. That and banana chocolate chip bread. Thanks for the reminder. I need to whip some up soon. I like to toast it if the loaf is around for more than a couple days. So delicious. Butter is always a good thing! Always!! 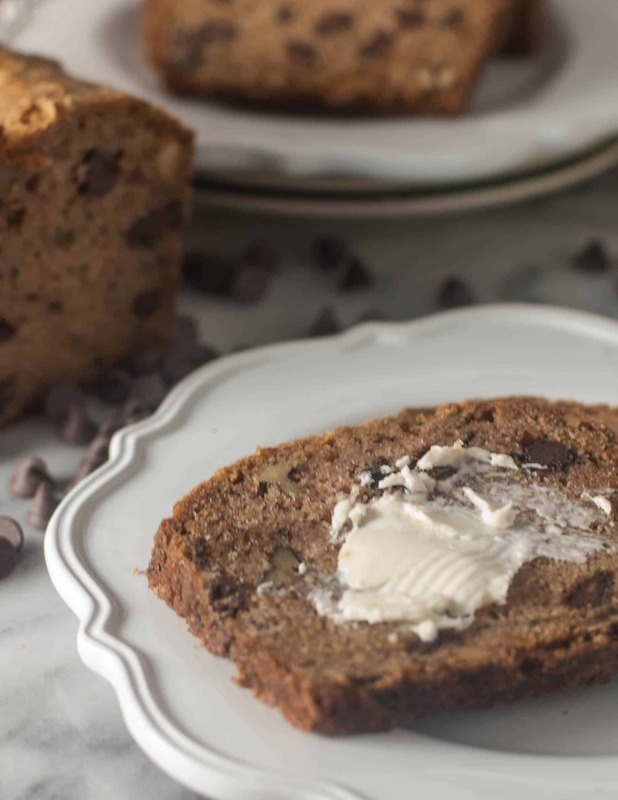 You know, I’ve never made (or eaten) banana chocolate chip bread. I might have to try that soon! And thank you for validating my butter love :)!